Holy Crap! I Can't Do THAT! You have an amazing goal in mind and you're all excited about it and then you see the big picture and how much work will be involved in achieving it and you're like "HOLY CRAP! I CAN'T DO THAT!" I've spent years studying goal setting and personal development and after all of my search I've been able to develop a 5 Step Goal Getting System that I use for everything I want to accomplish and it makes everything sooo much better. Part of that system is called "Your Infinity Growth Potential" and in it I show my clients that starting with the big picture in mind is productive but focusing all your energy on it is counterproductive. When you focus on the big picture (let's compare it to a watermelon), you will feel overwhelmed, because at this very moment in time, you're a little pea. You're thinking to yourself "Holy crap! That's not only way too big, but it's also way too far out in the distance". So what do you do? You give up before you even start! Every goal you will ever have, whether big or small, is made up of little steps. Each step brings you closer to your goal. Right now you're a little pea, so instead of focusing on that big watermelon, simply focus on the first step - the grape. You'll look at the grape and think to yourself "Well... it's a bit bigger than me so I'll have to stretch a little but it's nothing I can't handle." So you take that step, accomplish it and here's the cool part: You've just become that grape! So now you're a grape and instead of looking at the big watermelon, you figure out what that next step is. The next step is a cherry. You look at it and think once again "it's a bit bigger than me but nothing I can't handle". You accomplish that step and now you've become the cherry! And you keep going this way until you've become the person necessary to take the final step to become the watermelon and finally accomplish your goal. Some of these goals are quick and easy and others will take more time. Life requires a price for everything we want and typically that price is very simple - personal development! That's right! There is a process that must be had to mold you into the person that you need to be, to attract everything you want. If you were the person you needed to be at this moment to get what you want, you'd already have it. If this is all you get from this article, you're ahead of most people already! As you grow into the person you need to be to get what you want, it will systematically be drawn to you in some way, shape, or form. It's also important to understand that life is not a race. You don't have to have everything figured out all at once. Take one goal at a time. Once you've accomplished one goal, you can then use the same process to achieve the others. 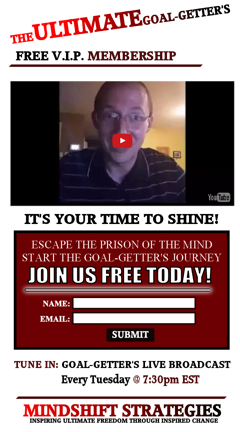 That's a snippet of the third step of my 5 Step Goal-Getter System. Feel free to grab your copy now if you found this of any value at all.